It’s been since late last year that I’ve written an entry for this blog, which gives you some idea of the pace at which things have been moving at the Museum and the Center. We negotiated and acquired the archive from the world’s oldest and largest art & climate organization, Cape Farewell, which was founded by artist David Buckland and for the last fifteen years has taken more than 350 artists, writers, and scientists into the polar regions. We also began to work with artist Trevor Paglen to plan how we might launch a satellite into orbit as an art project sometime during the next two years, and mapped out what the program will be for the 2017 A+E Conference (save the dates: October 19 –21, 2017). Test balloon for Travor Paglen’s Orbital Reflector. 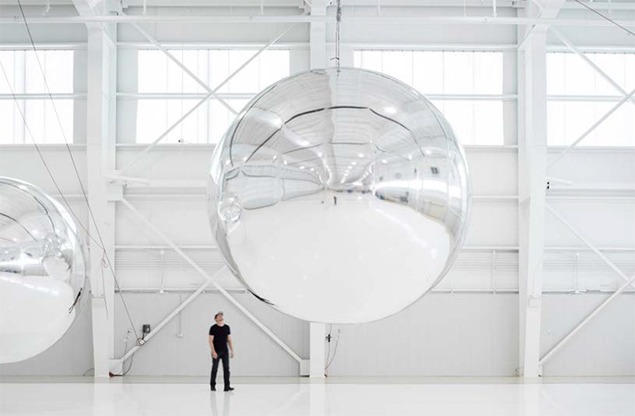 Image courtesy of Trevor Paglen. But the most consuming project has been opening Ugo Rondinone’s Seven Magic Mountains sculpture next to Jean Dry Lake outside Las Vegas. Five years in the planning, permitting, construction, and siting, the seven towers of limestone boulders sit on the southern end of the old Las Vegas Boulevard and next to the freeway to Los Angeles. An estimated 40 million people will pass by in the cars during the two years that the installation will be up. Each of the 33 boulders weighs an average of 44,000 lbs, the heaviest clocking in at 56,000 lbs. And each is painted in one of ten day-glo colors from the spectrum. I stood at the edge of the desert patch that’s been restored after the boulders were stacked on site, neat rings to catch water surrounding each of the replanted desert shrubs, and listened as people reacted. With me were two friends, Guido Deiro and Gianfranco Gorgoni. Guido worked for years as Michael Heizer’s pilot and land agent, securing the property for legendary works such as Double Negative, City, and the first version of Walter De Maria’s the Lightning Field, which was actually built in Arizona and then abandoned for lack of sufficient lightning. Gianfranco became the first significant photographer to document the building of Smithson’s Spiral Jetty, as well as its multiple drownings and uncoverings throughout the years, as well as Heizer’s early works done on Jean Dry Lake, such as his motorcycle drawing Circular Surface Planar Displacement Drawing. Guido actually flew Gianfranco to take some of those pictures. 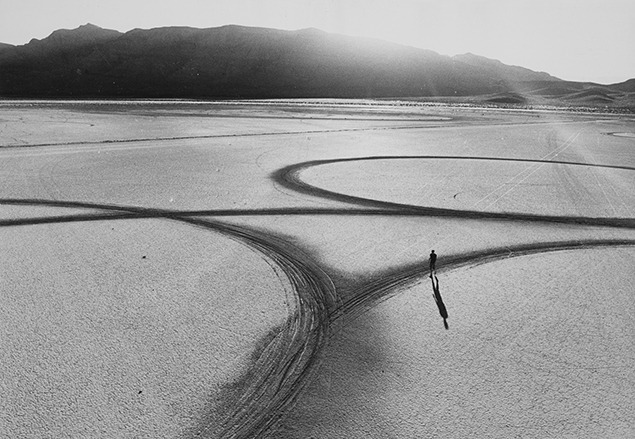 Michael Heizer’s 1970 motorcycle lines on Jean Dry Lake, Circular Surface Planar Displacement Drawing. Photograph by Gianfranco Gorgoni. People were asking several questions. First, why the colors when the boulders looked so good before painted? One answer is that Rondinone is deliberately contrasting nature and culture, another is that he is alluding to the spectacle of neon Las Vegas just out of sight over the nearby hills. Another more historical reason is that the largest stones ever moved, the Colossi of Memnon in erected 3500 years ago near Thebes in Egypt, which now present us twin visages of wind-blasted sandstone, were originally painted. Placing bright totems in the desert has a long history, indeed. Another question revolves around whether or not Seven Magic Mountains is a site-specific installation. See above. More interestingly, people inquired if this was Land Art, such as the projects by Heizer and De Maria. Rondinone himself answered that notion. “Land Art only existed during a moment, the last 1960s and early 1970s.” Rondinone’s partner of nineteen years, the legendary poet John Giorno, when first seeing the installation earlier in the day, exclaimed: “This is Pop Art meets Land Art,” an idea which we all readily adopted. The great gift of Heizer and his colleagues is that they created a new vocabulary for art, one that used earth itself as a sculptural medium, often shaped with or defined by inserts and supports made of wood, metal, and concrete. It was a medium Heizer used to define negative space as a positive entity (Double Negative being the definitive example); that Smithson used to exemplify entropy (Spiral Jetty, among other things, being an ancient symbol related to the concept); and, that De Maria used as both a surface for a mile-long drawing and as one of the four components of what is arguably the most iconic work from the period, The Lightning Field. That vocabulary has been adopted, adapted and deployed throughout the world by artists and architects from Maya Lin and Lauren Bon in the U.S, to Chris Drury and Charles Jencks in the UK. 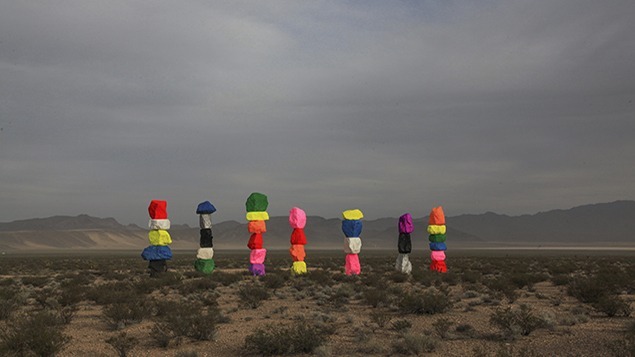 Ugo Rondinone’s career is a rich and diverse one, and Land Art a much more complicated and international story than I’m presenting here, and we’re hoping that Seven Magic Mountains will prompt people to think about everything from the nearby rock art in Sloan Canyon to the nature of contemporary art. And the archive from the project, which will reside at the Center for Art + Environment will provide researchers with everything from drawings and press articles to rock samples and signage. Those materials join thousands of images by Gianfranco Gorgoni that range over more than 40 years of artists working in the desert, as well as materials from Guido Deiro and others, that together comprise an ongoing record of Land Art and its inheritors. 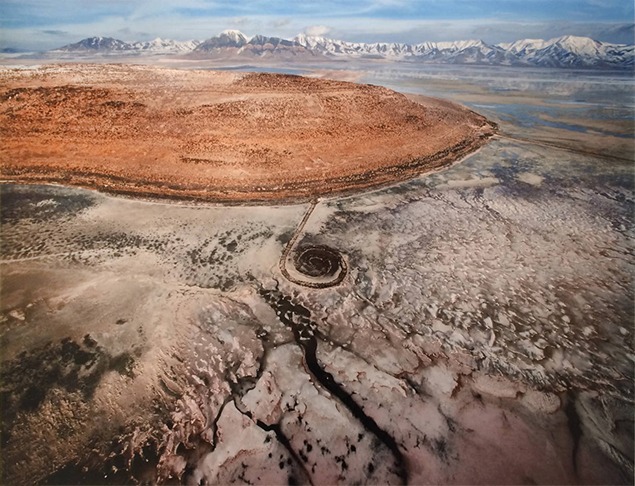 Robert Smithson’s Spiral Jetty in 2013 as photographed by Gianfranco Gorgoni.